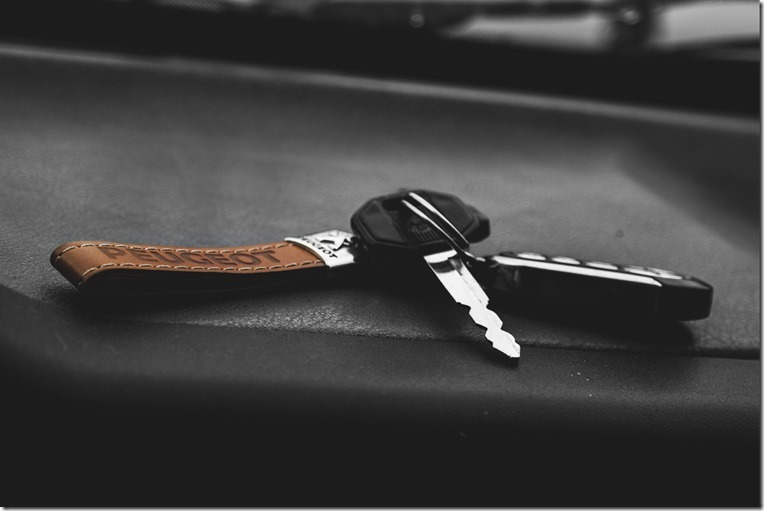 Whether it’s Personal Contract Hire (PCH), Personal Contract Purchase (PCP) or Hire Purchase (HP), all forms of car finance usually require some form of upfront deposit before you can get behind the wheel. As the UK’s number one leasing website, we’ve noticed a surge in popularity for low deposit deals. In fact, we think one month initial payments could change the face of the leasing industry, and the new car sector altogether. Our own data shows that the most popular length of a lease deal is two years, with two-year contracts representing almost 60% of all enquiries last year. It���s clear that as technology and safety evolve at a rapid rate, people are changing their cars more often to keep up with the pace. For those not in the know. PCH is effectively a long-term car rental. With a lease agreement you effectively agree to hire a vehicle for a set period of time based on a pre-agreed annual mileage. There is an initial rental (usually three, six or nine times the monthly rental) in the first month, followed by monthly payments spread over the length of the agreement. The larger the initial payment, the lower the monthly payments will be, and vice versa. This allows you to tailor the agreement to suit your needs. Last year, we saw an increase in popularity for rental profiles featuring a low, three-month initial payment. As dealers and brokers start to offer more and more one month initial rental lease deals, we believe there will be a further swing toward lower upfront costs and shorter contract lengths. The growth of subscription services like Netflix and Spotify are clear indications of a shift towards usership over ownership and the new car sector will also start to move towards a more subscription-based model. Just take a look at the upcoming Volvo XC40. It’s not just on trend thanks to its upmarket SUV credentials, but also because it’s available as part of a new Care By Volvo package, which essentially rolls motoring’s main costs (except fuel) into a single monthly payment. 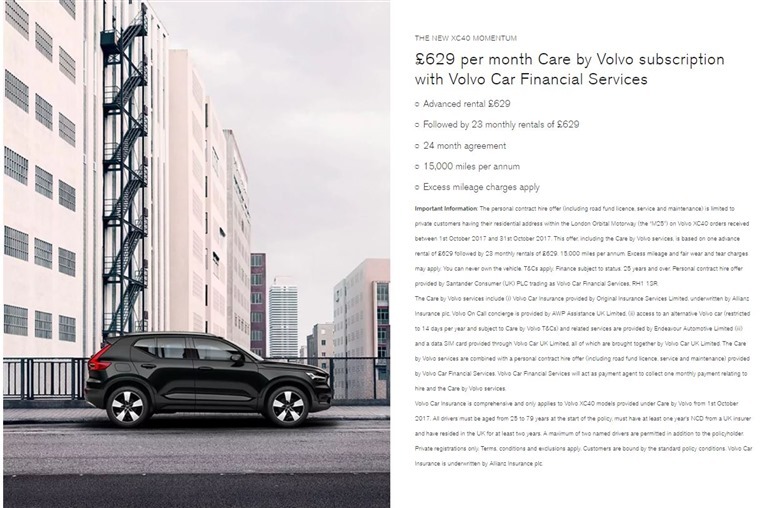 What’s more, the plan – that Volvo actually calls a subscription service – is based on one advance rental of £629 followed by 23 monthly rentals of £629. That might seem a little steep, but considering it includes insurance for two drivers you can see the appeal. Rolling costs into one monthly payment? If you want to create a lease deal that’s similar to Volvo’s above, you can opt for a lease that includes maintenance. This varies between suppliers, but generally maintenance packages will include annual servicing and any warranty work necessary. You will, however, need to source your own insurance. 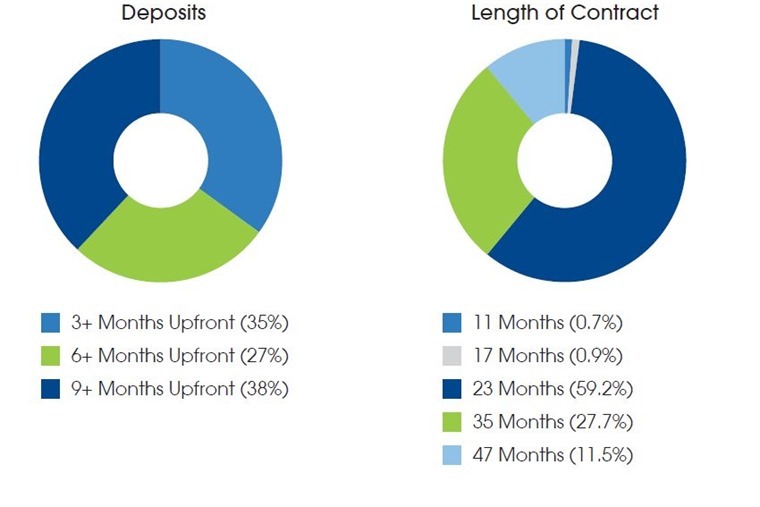 How much do low deposits affect monthly payments? 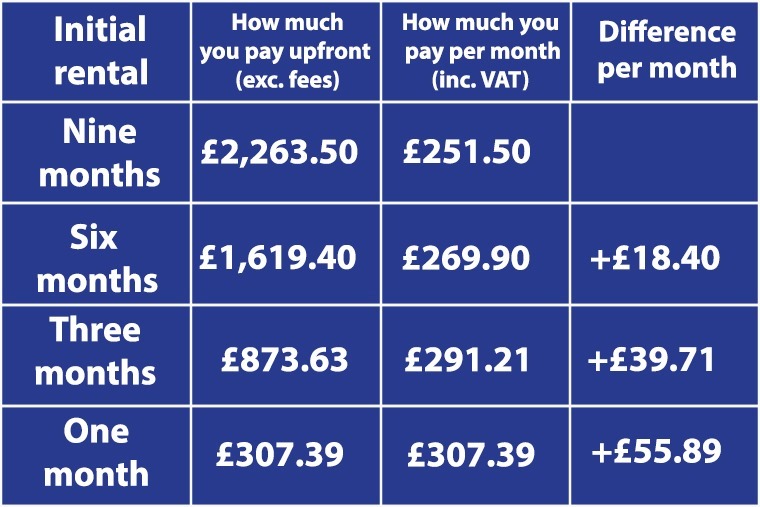 If the quoted monthly payment is £291.21, a three-month initial payment in the first month would equate to £873.63 (3 x £291.21). However, as an example, if you were to choose a one-month initial payment on the other hand, the monthly payment may increase slightly but you would only need to pay that amount as the first payment. This in effect allows you to get behind the wheel of your car without paying a larger upfront fee. 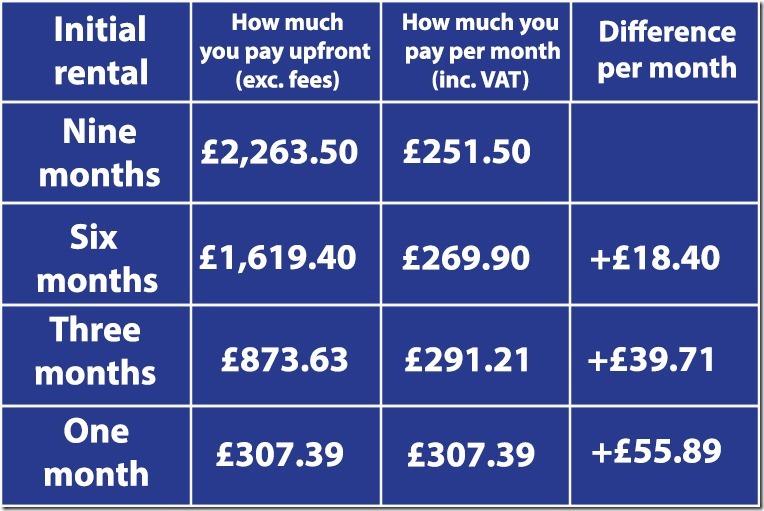 Obviously the more you put down up front, the cheaper the monthly payments will be, and vice versa, so before you decide to pick a lower initial payment it’s always worth working out how much extra you’ll be paying a month to make sure you can afford the extra cost. 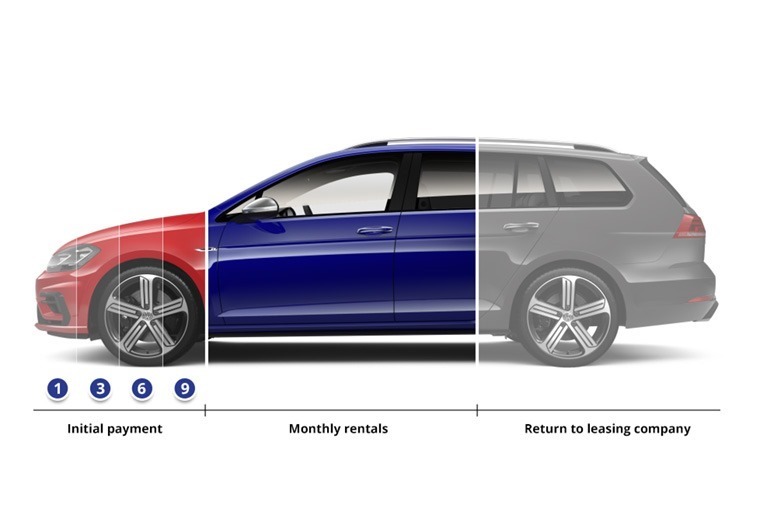 The gif and table below show an example of a Volkswagen Golf lease deal with a number of initial rental options – nine, six, three and one-month initial payments. We kept the rental profile the same (three-year deal, 10,000 miles p/a mileage allowance) to see the difference initial rental makes to monthly payments. Whether you choose a one-month or nine-month initial payment, the rental profile doesn’t include any extra fees that dealers may charge – any additional charges are clearly marked on all the lease deals on our site. It’s also worth bearing in mind that all lease deals are subject to a credit check and, in some cases, the dealer may require a higher initial rental sum to reduce the risk from its own perspective. In these instances, one-month initial rentals won’t be possible.